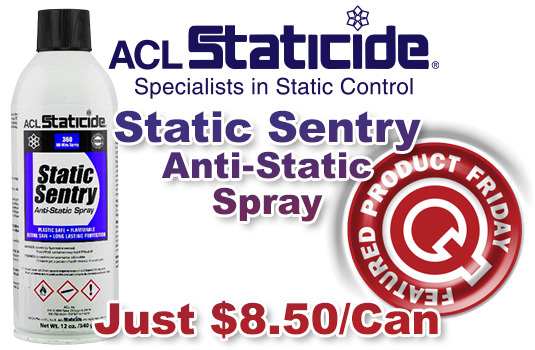 Save more than 29% (off MSRP) on ACL Staticide’s 2006 Static Sentry 12-oz. can. Just use our FPF020516 Coupon Code (auto applied) to get the discount. This Featured Product Friday (FPF) promo is valid from today, February 5, 2016 through Sunday, February 7, 2016. ACL Staticide’s 2006 Static Sentry instantly eliminates static, inhibits tribogeneration, and is safe on all fabrics and both porous and non-porous materials. This dissipative, humidity independent formula prevents dust attraction, is stable, and provides excellent static control in harsh environments. For further questions about Featured Product Friday, please read our informational blog post, call us (800-966-6020), or send us an email. Please note: This promo is valid only at QSource.com and expires on February 7, 2016.